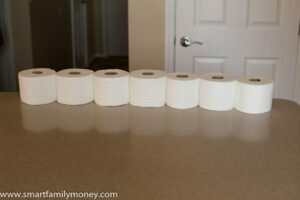 This post is another addition to my series about saving money on toilet paper. 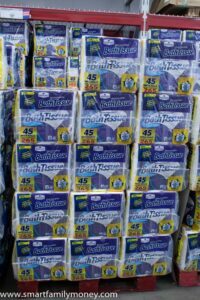 If you want to read a summary of all the posts, check out my ultimate guide to cheap toilet paper. I was very excited (some might say unnaturally excited) to see that Amazon now has their own Prime-exclusive line of toilet paper. The line is called Presto! And yes, the exclamation point is part of the name. It seems perfect for someone like me who gets excited about toilet paper! After my original review of the best generic toilet paper, I still felt like my family didn’t find our “Goldilocks” toilet paper. 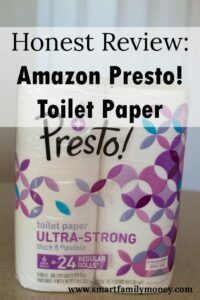 I had high hopes that Presto toilet paper was the perfect one for us! 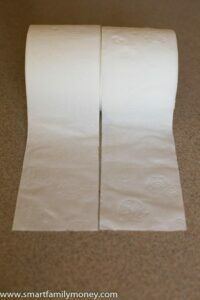 I ordered a box of both the Ultra-Strong and Ultra-Soft versions of Presto toilet paper. It conveniently arrived on my doorstep in 2 days. As a busy mom, I like convenience, so this toilet paper was already winning in my book! Is Amazon Messing with Me? 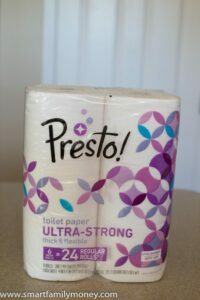 I was very confused because Presto Ultra-Strong toilet paper and Presto Ultra-Soft toilet paper LOOKED EXACTLY THE SAME! They had the same pattern on them and they feel very much alike. You can see in our detailed ratings below that the two varieties did have different test results, so they are not actually identical. I don’t know why Amazon didn’t put a different pattern on them so people can tell them apart, though! It’s unnecessarily confusing. This toilet paper should be named Strong and Scratchy! She certainly makes her opinions known! We tried the Presto Ultra-Soft as well and liked it much better. Read on for a more detailed analysis. My son demonstrating our strength test procedures. We are not new to testing toilet paper in this household. 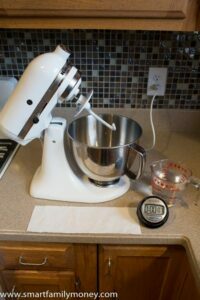 In fact, my best friend pointed out that when my kids are grown, they will probably tell stories about the piles of toilet paper stacked up in our dining room and how I made them watch toilet paper stir around in our mixer. 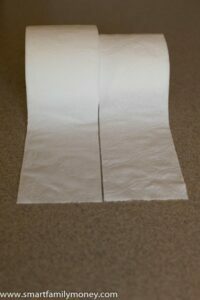 We submitted the Presto Toilet Paper to the same tests as previous toilet papers. 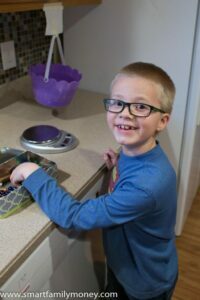 You can read a detailed account of our testing methods on my post about science experiments with toilet paper. All of the brands of toilet paper I tested in this round. Presto Ultra-Strong did not rate low in any area. 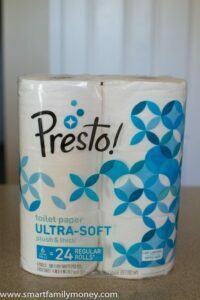 Which Brand Does Presto Toilet Paper Compare To? How does Amazon Presto Toilet Paper STACK UP to the competition? 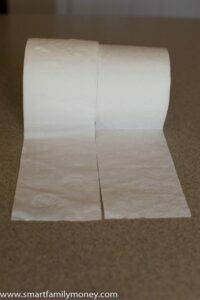 I compared Presto Ultra Strong toilet papers side-by-side with these name brand toilet papers, so you could know how it stacks up to your favorite brand. Which Brand Does Presto Ultra-Strong Toilet Paper Compare To? Presto Ultra-Strong compares most closely to Charmin Ultra Strong. If you like Charmin Ultra Strong, you might also like Presto Ultra-Strong. They have a similar feel, thickness, and quality. Which Brand Does Presto Ultra-Soft Toilet Paper Compare To? You might imagine that Presto Ultra-Soft would compare most closely with Charmin Ultra Soft, but it really does not! Charmin Ultra Soft is MUCH softer and fluffier than Presto Ultra-Soft. I do not think lovers of Charmin Ultra Soft would be very happy with Presto Ultra-Soft. On a positive note, Presto Ultra-Soft is less linty than Charmin Ultra Soft. I think Presto Ultra-Soft compares most closely to Quilted Northern Soft & Strong. They have a very similar feel to them. If you like Quilted Northern Soft & Strong, you might like Presto Ultra-Soft. Is Presto Toilet Paper Safe for Septic Tanks? Presto toilet paper states on the package that it is “septic safe”. (NOTE: I have actually never seen a toilet paper that doesn’t state that it’s septic safe.) There is definitely a difference in dissolvability of toilet papers, though. 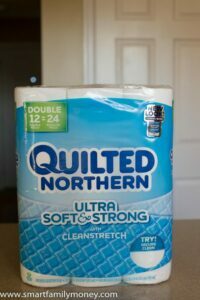 Charmin and Quilted Northern took around 90 seconds to even start to dissolve in my test. Amazon’s Presto toilet paper dissolved to tiny pieces in about 10 seconds! That’s why I gave it a HIGH rating for dissolvability. I think Presto toilet paper is very unlikely to clog up your plumbing or septic tank. I think it would be an excellent choice for families who want a high-quality toilet paper that won’t hurt their sensitive plumbing. Is Presto Toilet Paper a Good Price? Compared to other toilet papers, Amazon’s Presto Toilet paper is a moderately good price. That price can be improved by using Amazon Subscribe & Save (5-20% discount) or an Amazon credit card (5% discount). There also appear to occasionally be coupons available for Presto. Without extra discounts, Presto toilet paper is somewhat cheaper than the best prices on major brand name toilet papers (Charmin & Quilted Northern), but more expensive than Angel Soft. Presto is also much more expensive than Kirkland Signature from Costco or Member’s Mark from Sam’s Club. Without discounts, Presto is also more expensive than all of the Aldi toilet papers. 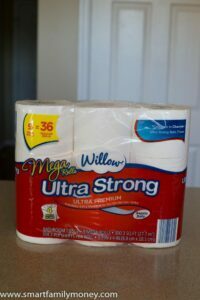 Aldi’s Willow Ultra Strong or Soft would be cheaper than Presto Toilet Paper and is a similar high quality. With every possible discount, Presto would be cheaper than Angel Soft and Aldi toilet papers, but still more expensive than Member’s Mark and Kirkland Signature. Member’s Mark was the overall winner for quality and value in my previous post about the best generic toilet paper. Member’s Mark toilet paper from Sam’s Club would be cheaper than Amazon Presto, even with all possible discounts. 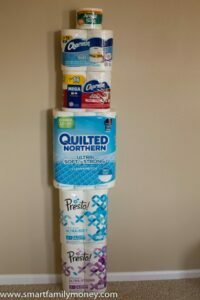 Bottom Line: You could save a bit if you switched to Presto toilet paper from Charmin or Quilted Northern, but you would save more using Member’s Mark or Kirkland Signature. Aldi toilet paper is also cheaper in most cases, and you don’t have to buy such a large volume. Will I Be Using Presto Toilet Paper? We will use up the two large cases of Presto toilet paper, and I would consider buying the Presto Ultra-Soft toilet paper again. A high-quality toilet paper that my whole family seems satisfied with. Dissolves quickly and should be easy on my plumbing. A good value when combined with coupons and other discounts. Will You Try Out Presto Toilet Paper? If you give it a try, let me know what you think in the comments below! Thank you so much for all of your TP testing! I thought I was a little crazy about TP until I found your page lol! This is serious business! We had repeated clogs in our plumbing and no one could figure out what the problem was. We even had our lines video-camered and they looked fine, except for some paper in the line!. 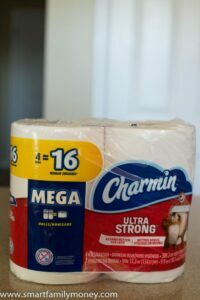 After going over all possible scenarios, talking to multiple plumbers, I remembered that at one point we did not have the problem, and that was before we starting using Charmin Ultra Strong. I went out and bought Scott Extra Soft and ever since then all has been PERFECT! Until… Scott changed Extra Soft to Comfort Plus. I don’t know why! Comfort Plus is a far inferior product – it tears easily and is very linty. So, now I’m on the search for a new TP. I’m intrigued by Presto! Ultra Soft. I had read other reviews, but nothing with your dissolvability test! That is a MAJOR factor for us. It was truly a nightmare when the pipes kept clogging. What about lint? I noticed it tested medium. What does that mean? Scott Extra Soft was virtually lint free. It was amazing. Comfort Plus is more like Charmin Ultra Soft in terms of lint. Deal breaker. Any way you could elaborate on the Presto! Ultra Soft lint? Does it have lint when you tear it off the roll? Wiping? Folding after wiping to wipe some more? Ha! Glad to meet another TP enthusiast! I called it “medium” for lint because it is somewhere in the middle of the spectrum. It didn’t leave the whole bathroom covered in lint like Charmin Soft but it wasn’t lint free either. If you rub it on a rough surface, there is some lint. Some of my testers complained about some left behind lint on their behinds. ?